Wow, what a busy couple months I’ve had! May was travel to Seattle, Los Angeles and Palm Springs (oh yeah, we were in PS when the temps hit 113!). Raced home on the red-eye to attend my daughters graduation awards dinner and commencement the next morning. Then had to get ready for Steve’s parents visit, graduation parties and somehow manage to get some work done in the office in between! Ge’ez, summer hasn’t even begun and I’m already exhausted! Not too exhausted to be a foodie though, which I’m glad of, cause I probably wouldn’t be blogging today if I hadn’t signed up for the Penpal program in the midst of all the chaos (am I nuts?). I did skip participating in May, no way could I make the deadlines! So, without further ado, woohoo, here’s what I received this month from dear Bethany from Boston, a Trader Joe’s Bonanza and a lovely handwritten note (which I forgot to put in the picture)! It arrived when my company was here, so before I even had a chance to take pictures, the goodies were opened! 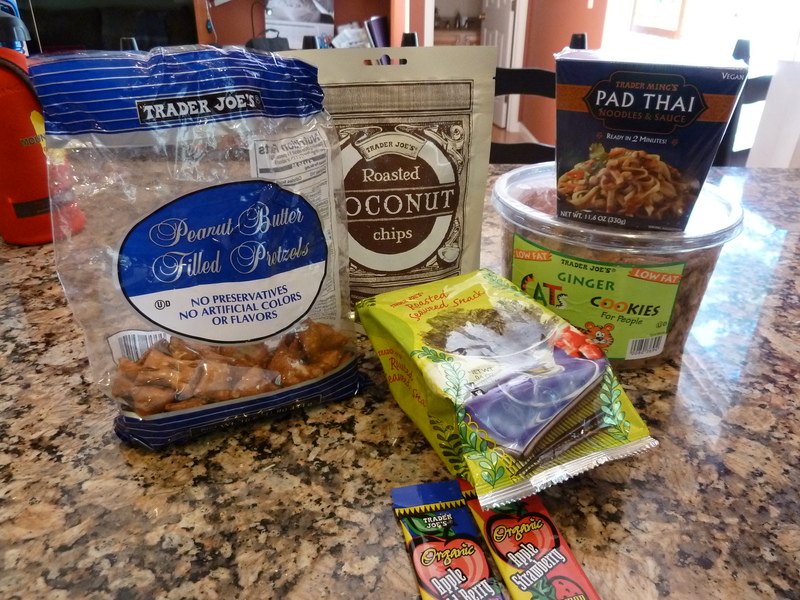 We loved the Trader Joes Peanut Butter pretzels, yummm….Bethany also sent 4 fruit leathers, 2 were gone in moments! Makes me want to take a trip to my nearest Trader Joes on my next shopping venture! Loved my goodies! Thanks so much, Bethany and special thanks to Lindsay at the Lean Green Bean for putting the Foodie Penpal program together every month. Has to be a labor of love on her part and I’ll bet I’m not alone in saying we love her for it! For a peek at what I sent my Penpal, hop on over to visit Soozcat at Confessions of a Laundry Faerie. If you have a hankering to try the Foodie Penpal program, the details are below! Interested in being a foodie penpal? If you’re from the US or Canada and are interested participating pleaseCLICK HERE to fill out the participation form and read the terms and conditions. You must submit your information by the 4th of the month, as pairings will be emailed on 5th! ← My first guest post! Foodie Penpal Reverse Reveal!